Connections and ideas continue to flow for the North West Craft Network. Ideas, small and large, hatched in the early part of the year are slowly coming to fruit, and we are beginning to revisit more ambitious plans that were seeded in early years and we now have the firmer foundation to start to make these things happen. Research, exhibition invitiations and information exchanged widely. Awards and opportunities for makers shared with Development Group and wider networks. As a result of connections made through the NW Craft network in 2014 Liam Hopkins was shortlisted for Arts Foundation’s Designer Maker of the year award 2019. Jo Kay, an audience development specialist and member of the network has shaped an ‘Audience Targeting for Craft Sales’ session for the next Meeting of the NW Craft Development Group (early 2019). This part of the meeting has been opened more widely to organisations who don’t usually attend the meeting but who sell craft. Crafts Council launched UK Craft Network, and we’ve talked with their lead on this to see how we can connect our North West members into this national network, exchange information and ideas, best practice and advocate for North West craft. ARC’s (Arts for Recovery in the Community) CPD programme for volunteers on their Pottery Pioneers project is underway and will engage Network members to train volunteers. A task group will meet in early 2019 to workshop a collective letter about the value of Craft to Education for circulation to educational policy makers. The Network will revisit its plans for an outstanding NW generated Craft showcase touring exhibition at our next meeting in March. This follows on from initial research in the previous years of the network. The Jerwood Makers Open will come to Manchester City Gallery and members are keen to get involved with collaborative projects. This will be developed at the next meeting. Manchester Craft and Design Centre connected with the lead on the Greater Manchester Cultural Strategy and we will be exploring collaborations. Professional coach and maker Victoria Scholes delivered the third of three business review days for residents and networks of Manchester Craft and Design Centre in January 2019. Excellent NW Craft exhibitions - invitations shared, including Thread Bearing Witness by Alice Kettle at the Whitworth, The Other in Mother (with ARC) at Manchester Art Gallery), Eunmi Kim at Manchester Craft And Design Centre, The University of Bolton School of the Arts Commemorative Show, Kate Hayward at Manchester Art Gallery, Great Northern Contemporary Craft Fair, Alice Rawsthorn Lecture at Bluecoat Display Centre to name just a few. Relevant Research exchanged. For example, research from Cockpit Arts about disruptions in the craft sector, The Crafts Council’s new video series ‘What’s Your Craft’, and Tom Sutton’s presentation ‘No Line on the Horizon’ summarising how current educational policy could impact on craft education and attainment in the future. Exploring the value of craft for health and wellbeing: Contact has been made with Clive Parkinson of The Manchester Institute for Arts, Health and Social Change to discuss potential speaks on craft and wellbeing for a future meeting. ARC (Arts for Recovery in the Community) are creating a development programme for volunteers that will connect with various Network members and their expertise and experience. Manchester Folk Festival created a programme of craft workshops to complement their music, driven by Jo Kay and encouraged by network members. Professional coach and maker Victoria Scholes delivered a business review day for contacts of Manchester Craft and Design Centre in August 2018. Plans are underway for a further day to be offered in January 2019. Manchester Craft and Design Centre (MCDC) continues to look at collaborations that will build the scale, value and audience for craft. Currently they are working with Yorkshire Artspace. Future possibilities include Creative Lancashire, NESTA, Crafts Council and ARC. The North West Craft Network is back in action! After a between-funding break, the NW Craft Network is back. We’re delighted to say that the Manchester Craft and Design Centre has been awarded some funding to pay for administrative support for the Network. This will allow us to meet and share information to help support contemporary craft in the North West. More to follow soon, but for the moment we’re getting our data in order and sending out emails to ask if you want to stay in touch. North West Craft Network - more news soon! We're between projects at the moment while we work on a funding plan for our goals around bringing makers and Museums together; developing a top quality touring craft exhibition for the North West and incubating our amazing NW talent. 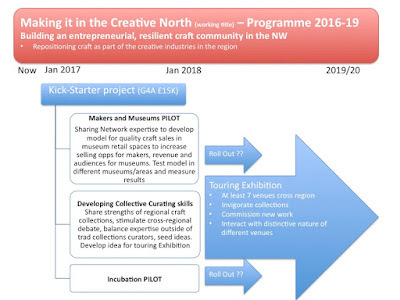 The North West Craft Network is planning an ambitious three-year programme to build an entrepreneurial, resilient and outstanding craft community in the North West that is positioned firmly at the heart of the region’s creative industries. We aim to grow the market, build audiences, increase revenue, incubate makers and keep our craft talent working and showing in the region. Makers and Museums. Developing and testing a model for the sale of high quality craft in NW museum retail spaces that will increase revenue and build the markets and audience for craft to the advantage of both makers and museums. Developing a proposal for a touring NW exhibition. A collective approach makes a stronger sector: we'll share expertise and collectively develop an outstanding idea for a touring craft show that will create a big message about craft, invigorate collections, commission new work and develop significant new audiences. Incubation. Exploring and testing sustainable options to develop and keep craft talent in the NW in the long term. All this comes from the opinions and data we gathered over the last two years from a wide range of craft professionals in the North West. The programme proposes a way to enhance the vitality of the North West craft sector and make it a recognised centre for national activity and excellence. To decide how to go forward, we asked ourselves a few key questions. What will we do best as this particular group of people? Some things are best done by individuals, partnerships or small groups - what can NW Craft Network do as a group that no other group could naturally do? What is ambitious and far reaching in its scope? And lastly and more practically, what is feasible for us to do? If we're successful in our bid to ACE, we should be up and running with this in early 2017. Watch this space for more, keep an eye on our Twitter account @nwcraftnetwork, or sign up to our mailing list. 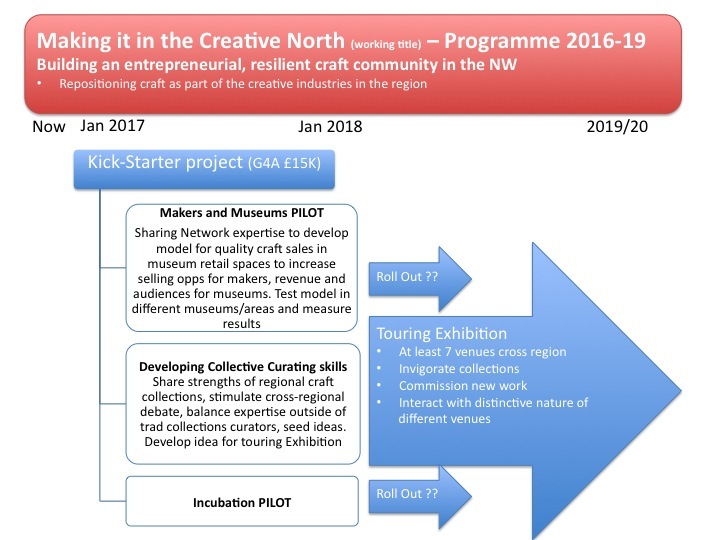 The NW Craft Network has been spending the year talking to makers, galleries, museums, craft and arts organisations from the region about what would make the most difference in terms of strengthening craft in the North West. We thought you'd like to know what came out of it all.